The Bayeux Tapestry is one of the most extraordinary artefacts to survive from the eleventh century. A fragile web of woollen thread on linen, its brilliant colours undimmed after nearly a thousand years, this masterpiece is unique as a complete example of an art form beloved of the aristocracy in the Romanesque era - the `historiated' or narrative embroidery. The momentous story it tells is that of one of the turning-points in English and European history, the struggle for the succession to the English throne which culminated in the Battle of Hastings in the fateful year of 1066. The version told is that of the Normans who commissioned it - of Harold's perjury and its dreadful price, death and defeat in battle. Yet the sympathies of the English hands that designed and created it are equally evident. And the Tapestry itself is so close to the events it describes, and portrays them in such vivid detail, as to make it in its own right a historical source of the first order, not only for the political crisis of 1064-66 but also for the social history of eleventh-century life. This book presents a full-colour reproduction of the entire Tapestry, with a detailed commentary alongside each episode, equipping the reader to follow the story blow by blow and this marvellous work of art step by step. In addition, a preliminary study sets the Tapestry in its artistic, cultural and historical context. 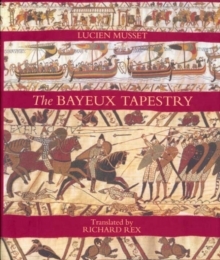 The late Lucien Musset, Emeritus Professor of the University of Caen, studied the Tapestry of nearby Bayeux for nearly fifty years. This erudite but highly readable survey distils a lifetime's scholarship into a wise and impeccably researched synthesis which enables the modern reader to appreciate what the Tapestry meant in the context of its time, at the start of the last millennium.